I had a big thing of blueberries, and I really needed to use them up, so I found this recipe. 🙂 It was definitely different than any other type of blueberry muffin I’ve had. The response I got to this muffin were mixed. 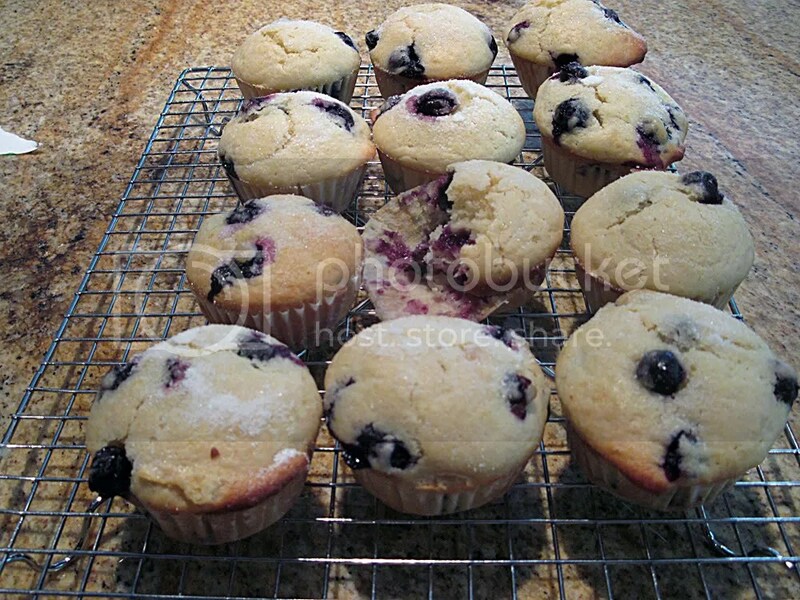 Prepare a muffin pan by either spraying with non-stick spray, or paper liners. Preheat the oven to 400F. Measure the orange juice, and add enough buttermilk to make one cup. Whisk in the honey, melted butter, and eggs. Put sugar and orange zest into a large bowl, and rub them together until the sugar is moist, and orange fragrance is strong. Then whisk the flour, baking soda, baking powder, and salt into the sugar. Pour the liquid ingredients onto the dry mixture, and either fold or whisk the ingredients quickly until blended. The batter may be bubbly and lumpy, but that’s okay! 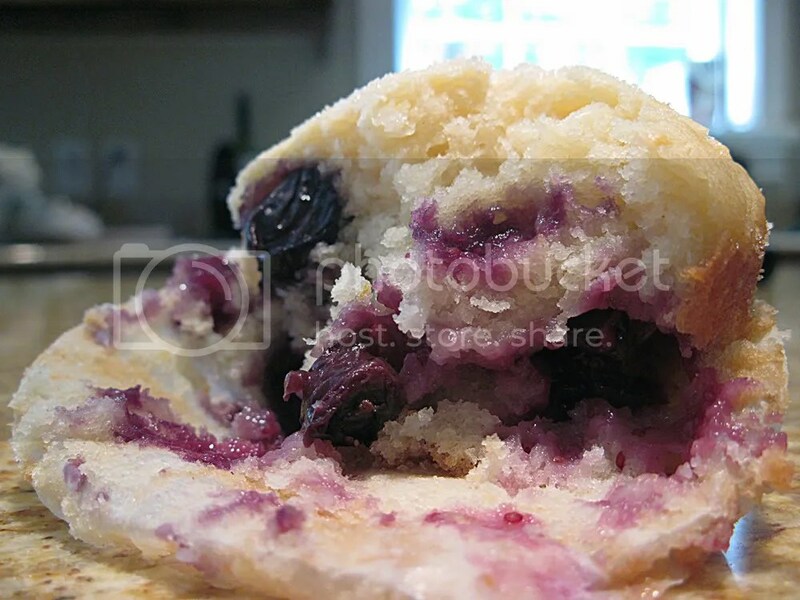 Stir in the blueberries, and divide the batter amongst the muffin cups. Bake the muffins for 22-25 minutes, or until a toothpick in the centre comes out clean. So I ran into some problems with this recipe. Firstly, I didn’t have any oranges, but luckily my grandfather picked me up some so I was able to use them. I didn’t have a microplane/zester for the orange, so I just used a grater. It was really fun though to rub the sugar and orange zest together, for some reason I was always envisioned this process as being SO fun, and it really was. I loved how the orange smell infused into the sugar, it smelt so good. Another issue I ran into was my honey. I don’t use honey on a regular basis (aka at all unless I’m baking) so my honey had crystallized. I was worried that it had maybe gone bad, but luckily it hadn’t (and can’t!) and once I microwaved the honey, it turned out great. For the recipe itself, if you like sweetness, this muffin is definitely lacking in it. The orange juice helps to sweeten it a bit, but it still tastes a bit bland. I found that I baked my muffins for about 20 minutes, and the tops weren’t brown but when I tried to eat the muffin itself, the sides were really tough. Also, when I took off the liner I found that the muffin disintegrated a bit which was annoying to eat. I think I picked up some bad blueberries too though because the blueberries themselves weren’t very sweet, so that was disappointing. I thought that these muffins were okay, and maybe with some tweaks they’d be great. My boyfriend, brother, and dad liked the muffins but my kid sister really hated them (haha). I wanted to try something different, so mission accomplished there, but I don’t know if I’ll be rushing to make them any time soon again.